Christmas is perhaps the biggest celebration around the world, as Christians come together to remember the birth of Jesus. Among Hispanics, there are many popular devotions during the season, from novenas to the traditional Misa del Gallo, that help us pass on the faith and culture from one generation to the next. As a mother of two little children, these traditions have become even more important since they help me instill in them the meaning of Christmas, and they help them want to welcome Jesus in their hearts. “Campanas de Belén” (“Bethlehem’s Bells”), “Noche de Paz” (“Silent Night”), “El Burrito Sabanero” (“The Little Donkey from the Savannah”) and “El Niño del Tambor” (“The Little Drummer Boy), are among the many Christmas carols that immerse us in the spirit of the season. There are novenas that can be prayed during Advent and others that culminate on Christmas day. The feast of the Immaculate Conception, for example, is celebrated in the United States, Panama, Spain and Paraguay; while Nicaraguans gather to pray “La Purísima,” a novena that culminates on Mary’s feast day, Dec. 8. Colombians and Ecuadorans celebrate with the Novena of Aguinaldos, or a Christmas novena. For nine days before Christmas, families and friends gather around the Nativity scene in their homes and pray a short series of prayers, followed by the singing of “villancicos” or Christmas carols, along with the sounds of maracas, guitars or any other instrument on hand. The image of the pregnant Madonna depicted by Our Lady of Guadalupe is a great reminder of the meaning of Advent as a time of waiting and preparing our hearts for Jesus’ birth. Her feast day is Dec. 12 and is widely celebrated among Hispanics throughout the United States and Mexico. Displaying a Nativity scene or crèche at home is another tradition that fills homes with pride and brings families together. Homes throughout Latin America and Spain often display elaborate Nativity sets that go beyond the basic manger scene. They may show the three kings on their way to Bethlehem, the apparition of the angel to the shepherds and shepherds on pilgrimage to adore Jesus, as well as the town of Bethlehem as a backdrop. Throughout the season, children will often move the shepherds closer to the manger. 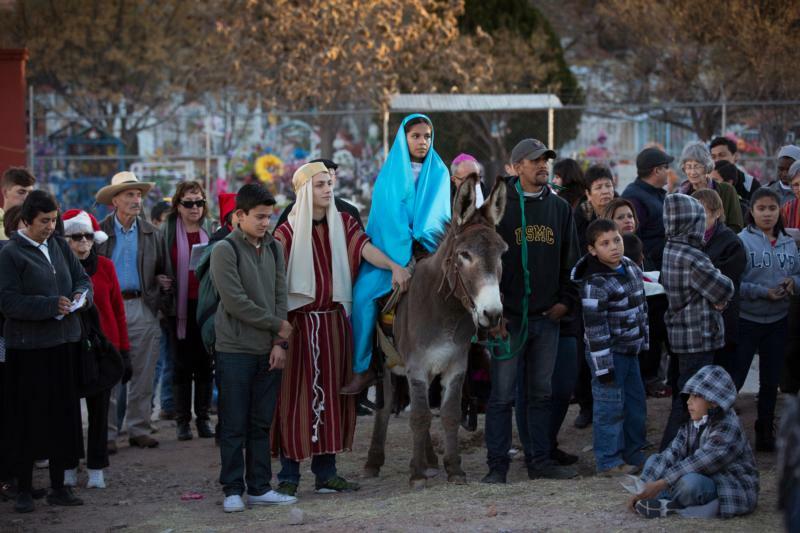 The Misa del Gallo and the living Nativity are other favorite traditions among Hispanics. The Misa del Gallo or Midnight Mass is traditionally celebrated around midnight on Christmas Eve. Parishes may display a Nativity with live actors during the Mass, as a visual way to explain to children the meaning of the day. Growing up, I participated in a living Nativity as a shepherd, and that experience stayed with me forever. On Christmas Eve, before or after Mass, Hispanic families usually share “la cena de Nochebuena” or Christmas Eve dinner. Homes are filled with the exquisite aromas of tamales, turkey, ham, lechón (oven roasted pig), along with tostones, buñuelos and rice pudding, while Christmas songs in English or Spanish play in the background and laughter and conversations flow among families and friends. It’s a night to celebrate the birth of Christ and exchange gifts, while the next morning, children will receive a surprise from Santa Claus. Traditions such as displaying the Nativity scene in our homes and attending the Misa del Gallo after Christmas Eve dinner have stayed with me throughout my life. However, as an immigrant and a mother, my family and I have also adopted other traditions, such as celebrating the Feast of Our Lady of Guadalupe and praying a Christmas novena. We love to invite family and friends to join us, and through them, we evangelize others and even reach out to those who might feel lonely. We also remind our children to think of others in need and not about their own wants, looking at the example of Jesus who was born in a manger, among the poor and the outcast. These traditions bring our family great spiritual rewards and keep us grounded in the true meaning of the season. Many of these traditions are shared in different ways among Catholics, across languages and cultures, and are a wonderful reminder of the one universal body of the Catholic Church to which we all belong. Norma Montenegro Flynn is a freelance journalist and communications consultant in Washington.